Successful captive breeding by the private sector is essential to the long-term survival of many chameleon species. Key to successful reproduction is the feeding management of gravid females. To address this vitally important topic, Dr Donoghue begins with a description of her typical chameleon patient. As I opened and read the email, my heart went out to the sender, a new chameleon keeper. Her story wasn’t unusual, though the details tend to vary slightly from one email to the next. The story goes something like this — a chameleon [mellers, senegal, rudis] is found [petshop, herp expo, internet], it is saved [purchased, bartered, given away]. After a few days of continued deterioration, the chameleon visits a veterinarian who determines that the chameleon is wild-caught, stressed and sick. Much care is needed to fix the chameleon [of dehydration, parasites, starvation, immune suppression], and now, after all that, she is visibly gravid. Next comes the reason for contact with me: How should this gravid chameleon be fed? In a perfect world, I could help this owner save both the mother and the babies. I’ll give it my best, but I explain to the owner to prepare for the worst. In a perfect world, we would have the hormone assays and treatment techniques perfected to deliver the eggs at the right time and save the clutch and mother. We would know the critical periods for nutritional management of reproductively active chameleons. Clinical trials measuring calorie and nutrient needs would be replicated in the field, laboratory, and in captive-breeding facilities. We would know exactly what to feed and when to feed. In the real world, however, we lack much data for chameleons and rely instead on practical experience with chameleons, the observations of astute and knowledgeable breeders, and research in other lizard species. To understand the nutrition of gravid chameleons, we start when our breeding female was just a gleam in her mother’s turret. We know that the size and robustness of a hatchling (or neonate, for live-bearers) depends in great part on the quantity and quality of yolk available to it as an embryo. The period of yolk-protein production (termed vitellogenesis) in the dam is critical. If she was underfed (because of an inept keeper or in the wild because of drought or illness, for example) her offspring will begin their lives with disadvantages. We also know from research in other lizards that factors during egg incubation can affect the duration of incubation and also the morphology of the hatchlings. From the time your breeding female was just a few cells, much has impacted her future breeding success. Yet the present state of chameleon theriogenology (veterinary reproduction) is infantile compared to many species. Top breeders of dogs or horses, for example, rarely purchase a female without complete exam of the reproductive tract, hormone assays and even biopsies. Poor nutrition of your breeding female’s dam may have caused irreparable damage to your chameleon’s reproductive system. Yet we purchase females to be our founding stock and serve as key breeders while having no knowledge of the soundness of their reproductive tracts and endocrine (hormone) systems. We are ‘buying blind’ and placing at least part of our breeding fates in the hands of others. When building a breeding program, begin with the best females you can find. Use risk/benefit analysis when choosing between stock that is wild-caught, bred by inexperienced keepers, or bred by experienced breeders. Know as much as you can about the competency and experience of those you buy from. To further our understanding of gravid chameleons, we next consider ontogeny, the biological development of an individual. For example, nutritional ontogeny of a pet dog involves shifts from puppy food to maintenance diets to senior petfoods. Nutritional ontogeny of a breeding dog would include diets for pre-pregnancy, early-pregnancy, late-pregnancy, and post-pregnancy. The best writings on ontogeny and its role in reptile breeding success come from Philippe de Vosjoli. Reading his articles in the last few issues of Vivarium magazine and more recently in ExoticDVM magazine will improve your success with chameleons. Classic ontogenic nutritional shifts are seen in omnivorous reptiles but smaller shifts occur with chameleons and other insectivorous carnivores. Chameleons shift prey selection as they grow larger, from fruit flies, springtails, and pinhead crickets to spiders, adult crickets, and many species of flying and crawling invertebrates. The largest species will also take appropriately sized vertebrates such as nestling birds or weanling rodents. 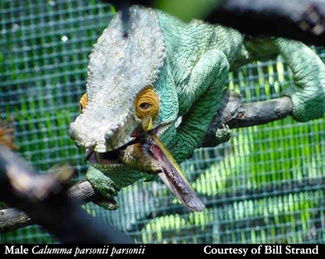 We also know that wild chameleons are relatively opportunistic feeders; some of you may remember that classic photo by Bill Love of an oustalet’s chameleon eating a panther chameleon in Madagascar. Recognizing the ontogenic development of chameleons, we then know that the diets and feeding management of non-breeding chameleons may not suffice for breeding chameleons, especially the females because they do most of the work. Calories, nitrogen and nutrients are utilized for maintenance and growth when chameleons are young. As females begin cycling reproductive hormones, calories, nitrogen and nutrients are diverted away from growth to support the production of hormones and then to support vitellogenesis. Production of egg yolk protein and transport of these proteins from liver to ovaries requires specific amino acids (suppliers of nitrogen), fatty acids, micronutrients (certain vitamins and trace minerals used in enzymes), and calories. If calories, nitrogen and nutrients are in short supply during this time, reproductive activity often shuts down. If reproduction isn’t shut down completely, failure to provide adequate nutrition will reduce egg yolk synthesis, compromising reproduction. One may end up with hatchlings or neonates, but they will be weak and suffer high mortality. Use of calories, nitrogen and nutrients by reptile embryos has been quantified in certain (non-chameleon) species. Few differences are found between oviparous (egg-laying) species and those species that are viviparous (live-bearing) with simply-structured placentas. However those species which are viviparous with complex placentas demonstrated a significant increase in weight and nutrients in the neonates. In oviparous species, nutrients from eggshell (calcium) and yolk (nitrogen, lipids, calcium, magnesium, trace minerals, vitamins) are transferred to the embryo. The source of these nutrients transferred from dam to young is the dam. Her source was diet. Thus you can see the importance of the nutritional status of your breeding female, beginning when she was an embryo and continuing in her early days, through adolescence and into reproductive maturity. · Study the risks/benefits of the sources of your breeding females and spend wisely. · Recognize the nutritional ontogeny of your females, and manage accordingly. Your feeding management will change as your female develops. · Monitor the health of your pre-breeding females by noting conditioning, recording weights, screening fecals, and observing behaviors. · Before your female is receptive to breeding, she will have already gone through the nutritionally demanding time of vitellogenesis. For success, sound diets must begin long before copulation. · Maternal diet is the source of calories, nitrogen, and nutrients utilized by chameleon embryos. Feed breeding females to the best of your ability. In subsequent issues, Dr Donoghue will discuss body condition scoring, feeding management during pregnancy, problems encountered with females at term, providing for the post-laying female, and nutritional support for sick, wild-caught gravid females.